This new multi-functional system is a programmable logic based unit that monitors production rates, detects jammed/missing product and controls the stop, feed, order and batch outputs. An encoder provides belt travel information. 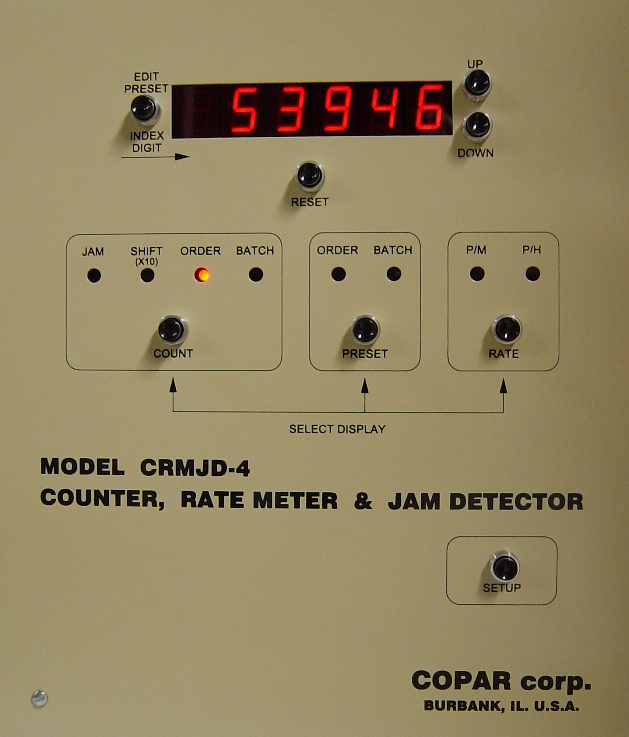 This data allows the CRMJD-4 to determine machine size, carton size, photo location, and ratio among other things. A six digit display shows processed information in relevant values, such as: on going counts of Jams, Shifts, Order and Batch; presets of Order and Batch; rates in Pieces/Minutes or Pieces/Hour. Values viewed in the display can be reset and or edited by manipulating a series of push buttons. Although the CRMJD was developed primarily for Flexo gluers, it has application on virtually any piece of production equipment.